[Lauren Shelburne | Banner] Gabe Venegas practices two latte art pours a day to prepare for the competition. Venegas served coffee to custumers at Restoration Roasters where he works as the shop manager. He uses the same cups every time to perfect the angles and ratios he pours. 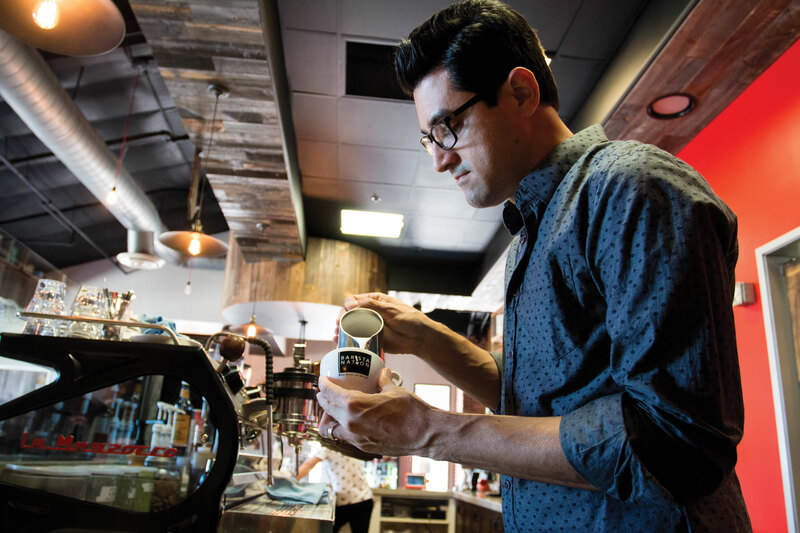 Steamed milk and a cup of espresso is not the typical canvas for most works of art, but local artist Gabe Venegas, shop manager of Corona’s Restoration Roasters, turns the two into latte art while competing against others. He will be competing among the top-64 competitors in the Coffee Fest Latte Art World Championship Open, which will begin Sept. 30 and continue through Oct. 2 in Anaheim, California. Venegas utilized his unique style to qualify for the second time. He is now bringing his craft to Restoration Roasters, training new baristas in his artform. His journey as a latte artist began in 2009 when he entered Klatch Coffee, a specialty coffee shop. He continued to develop his style through his own trial and error. Well-known artists can be identified by their pour by the latte art community. Venegas hopes to get there but is currently still discovering who he is as an artist. Venegas will be competing against artists from whom he draws inspiration from and admires. Standing on a stage in front of spectators under a spotlight is not the usual background he is used to, he said. “The pressure is unlike any local throwdown,” Venegas said. Competitors have three minutes for each pour but receive a speed point if they finish before their opponent. Judging is based on aesthetic, definition, color infusion, degree of difficulty and creativity. Latte art is divided into two categories: free pour and etching. Etching is a design crafted after the latte is poured through foam and powder. Free pour is what Venegas competes in and what is favored more in the United States. These designs are made while the steamed milk is poured into the shot of espresso through different maneuvers. Venegas prefers to pour a rosetta, which is the most complex pour and resembles a fern. Latte art may look easy to some, but there are many factors that go into crafting a perfect design. Chanelle Canfield, senior Christian studies major tried her hand at it when she worked in a cafe in high school. When Venegas joined the team at Restoration Roasters, he incorporated his experience in latte art to the shop’s daily drinks. He is able to share his knowledge and teach others. “It’s great to see them be essentially where I was once, but I get to be there to guide them through it and help them grow since I didn’t really have that,” Venegas said. Kendall Rummell, 2016 alumnus, trained under Venegas during his six months as a volunteer at Restoration Roasters. Venegas advised aspiring latte artists to continue to practice, for the skill is not as easy as one might think and takes repetition and patience, as well, he said. Venegas will join the 63 other competitors at the Latte Art World Championship Open in Anaheim at the end of the month, applying his style of pour and art to win the competition. The format is described as being “sudden death,” where the competitor who receives the highest score from a panel of three judges will move on to the next round while the loser is eliminated from the competition. Venegas will be on the clock, as each competitor gets three minutes to free pour two pours for the judges. Visit www.CoffeeFest.com for information and updates.